Sunday changeovers, avoid the traffic ! Weekends & 10 day breaks possible.It's difficult to offer all options using the calender on this site, please get in touch for more flexible stays. The Chalet du Saut, private ski chalet, remodelled Savoyard farmhouse, dating from 1637 retains many original stone and wooden features. It offers 200m² of accommodation, & comfortably sleeps 12/14 in 6 bedrooms & mezzanine, with 4 bathrooms. The large, yet cosy living area around the log fireplace, and a kitchen and dining area, designed to cater for large dinner parties, make it ideal for extended family groups, or just groups of friends. It is in the traditional alpine hamlet of the Villaret du Nial, a privileged, discreet and peaceful location, in the heart of the snow sure Espace Killy ski area. The hamlet is nestled on the south facing slopes above the road to Valdisere and overlooks the Tignes dam. 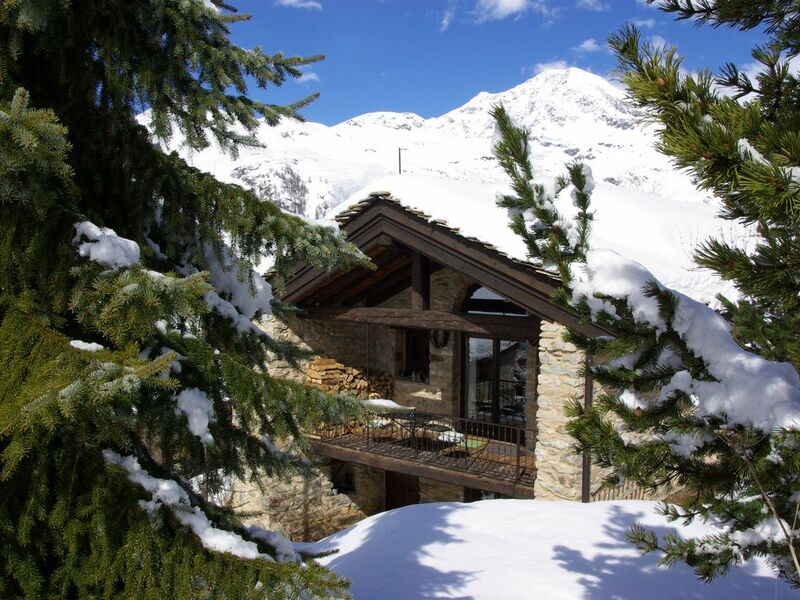 Situated 4 kilometres (5 mins) from the funicular and ski pistes of Val d'Isere and 3kms from the new Télécabine & pistes at Tignes les Boisses, the chalet offers the best of both worlds, a major ski area, without the hustle and bustle of a holiday resort. There is private car parking at the chalet. The surroundings are well suited to children, no traffic, lots of sun, and a garden to play in. - Open fireplace, wood supplied - Satellite TV, video, DVD, stereo, free local calls, free & unlimited WIFI. - Bed linen and towels are supplied, 2 folding travel cots & high chairs available. Accueil chaleureux du propriétaire du chalet . Réponse immédiate à toutes nos questions. Situation à quelques km des pistes mais sa situation dans un petit hameau au calme est très sympa. La pièce de vie est spacieuse et très cosi avec une belle cheminée. Nous recommandons vivement. Très beau chalet, tout confort. Propriétaire adorable. Leticia et sa famille génial ! Robert(le proprio) est très cool et avenant. Rien à redire, c'est une location sans surprise très bien entretenue avec du cachet. "Location remarquable, très propre, parfaitement conforme au descriptif,un niveau de prestation exceptionnel (linge, matériel de cuisine, décoration, confort de la literie) avec des propriétaires charmants et accueillants, très conciliants. Nous avons jamais vu une location d''un tel niveau de qualité. From Bourg st Maurice follow the D907 towards Val d'Isere, after the Tignes dam, half way along the lake, turn left up the "route de la Sassiere" the chalet is 350 meters on your right. Val D'Isere and neighbouring ski resort Tignes make up the Espace Killy ski area. Made up of 300kms of pistes with 137 different runs to choose from, 9 slalom stadiums, 2 mogul fields, 2 half pipes, 2 snow parks and 97 mostly high speed lifts to get you round the mountains. There are bigger ski playgrounds in Europe, but not with terrain as well linked, groomed or varied as that of Espace Killy in France. Taking in the resorts of Val d'Isère and Tignes, you'll clock up more skiing miles here in a week than anywhere else in the world, whether you're a beginner or an expert. For beginners and intermediates there are huge open bowls, gently winding trails and high altitude "motorways" to cruise. For experts there are vast off-piste playgrounds, littered with steeps, shoots, gullies, cliffs and trees. With glacier skiing at up to 3,455m and integrated snow making, covering the whole area, snow is also guaranteed - even in August. Attention les tarfis affichées sont des tarifs"semaine", valables pour des séjours a partir de 6 nuits, contactez moi pour les tarifs weekend et courte séjour. Tarif dégressif en fonction de la durée, Ces prix comprennent , le linge, le bois pour la cheminée, les appels téléphoniques locaux, l’accès internet WIFI…………. Non compris est le ménage de sortie, vous avez toujours le choix de rendre le chalet comme vous l'aviez trouvé. Taxe de séjour a régler sur place.